Lyra has found her way home… only to find her town hit by a devastating storm. In search of power, the evil fairy queen of Dreams has cast a terrible curse over all of Wish. With her father gravely ill and her mother missing, Lyra must find a way to break the spell. 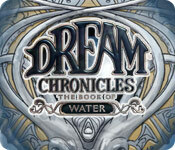 Journey through beautifully enchanted places, solve challenging puzzles, and seek answers to save Lyra’s hometown in Dream Chronicles: The Book of Water! The Dark Piper unleashes infested rodents into the town of Hamelin! Defeat him before he leaves a trail of destruction all across Europe!